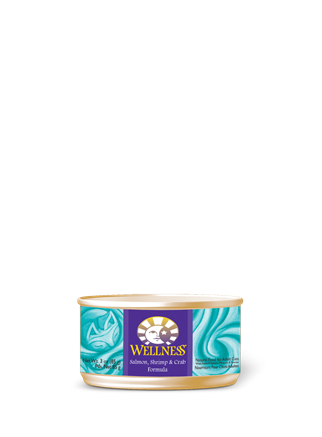 Wellness® Canned Salmon, Shrimp & Crab Recipe provides three sources of high quality protein. Salmon, shrimp and crab are excellent sources of long chain Omega 3 fatty acids which are critical for healthy skin and coat, proper body function and enhanced learning. Salmon, Chicken, Fish Broth, Brown Rice Flour, Shrimp, Crab, Carrots, Sweet Potatoes, Squash, Zucchini, Guar Gum, Cranberries, Blueberries, Ground Flaxseed, Carrageenan, Potassium Chloride, Taurine, Salt, Choline Chloride, Iron Proteinate (a source of Chelated Iron), Zinc Proteinate (a source of Chelated Zinc), Beta Carotene, Vitamin E Supplement, Thiamine Mononitrate, Copper Proteinate (a source of Chelated Copper), Manganese Proteinate (a source of Chelated Manganese), Sodium Selenite, Niacin Supplement, d-Calcium Pantothenate, Pyridoxine Hydrochloride, Riboflavin Supplement, Vitamin A Supplement, Biotin, Potassium Iodide, Vitamin D3 Supplement, Vitamin B12 Supplement, Folic Acid. 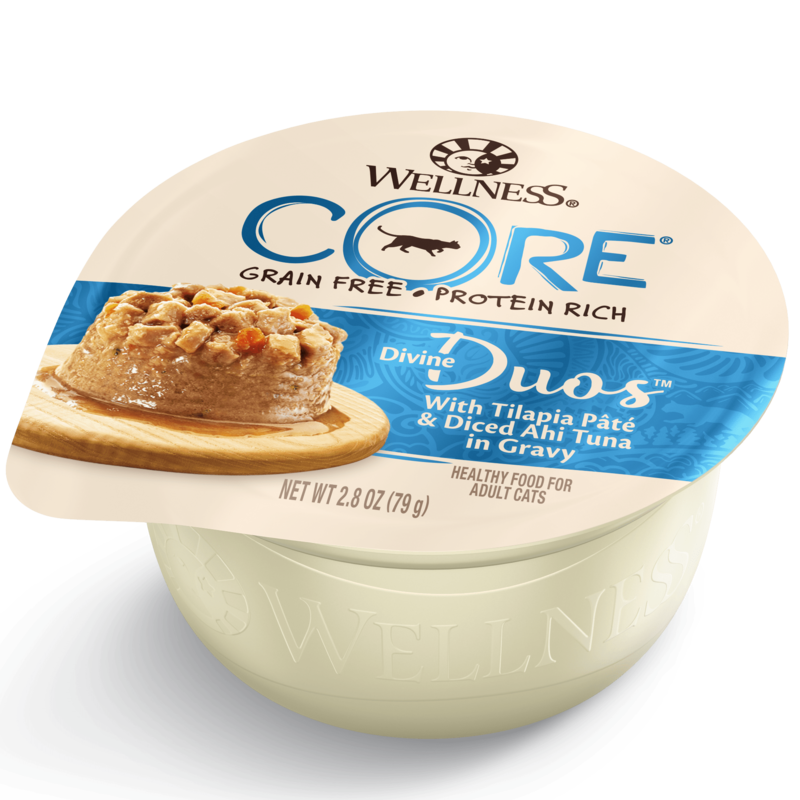 For adult cats. Best at room temperature. Refrigerate unused portion. Always provide access to clean, fresh water. Adjust as needed. To feed alone: about 170oz per 3lbs of body weight per day. To feed with dry: reduce dry by 32oz for every 85oz wet. Feeding Information: For adult cats. Best at room temperature. Refrigerate unused portion. Always provide access to clean, fresh water. Adjust as needed. To feed alone: about 156oz per 3lbs of body weight per day. To feed with dry: reduce dry by 32oz for every 76oz wet. Feeding Information: For adult cats. Best at room temperature. Refrigerate unused portion. Always provide access to clean, fresh water. Adjust as needed. To feed alone: about 170oz per 3lbs of body weight per day. To feed with dry: reduce dry by 32oz for every 89oz wet. 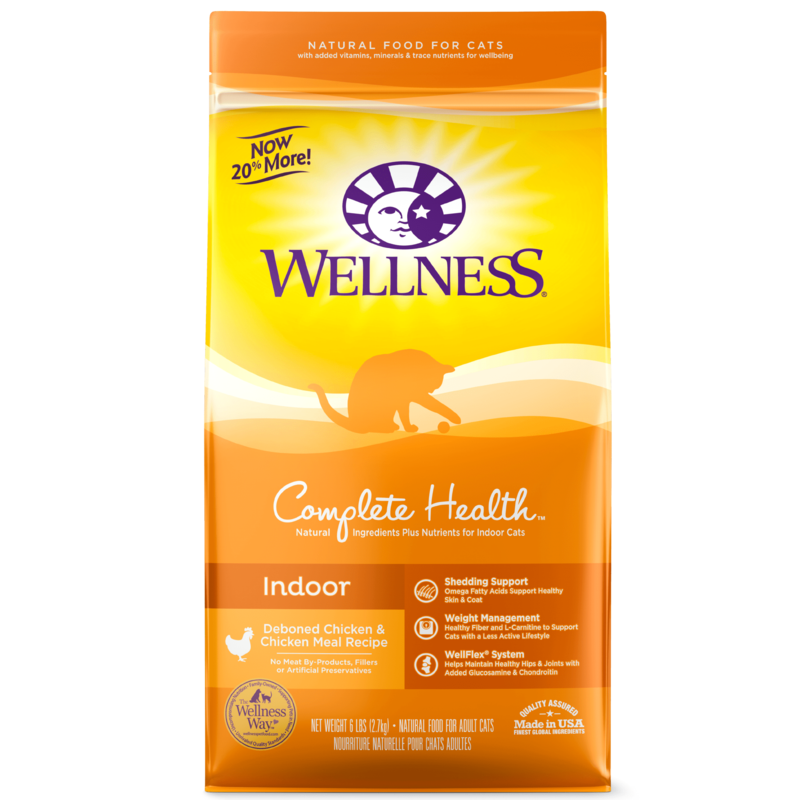 Wellness® Canned Salmon, Shrimp & Crab Recipe is formulated to meet the nutritional levels established by the AAFCO Cat Food Nutrition Profiles for maintenance.